The ultimate Steam companion app for Windows Phone! 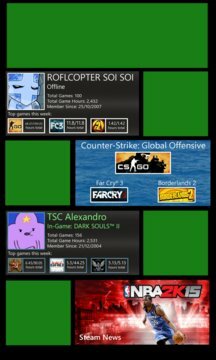 Pin your own and your friends Steam profiles right to your home screen. With detailed and desirable information. Browse profile information in fantastic Windows Phone style, along with top games, friends, inventory and much more. • Slick Operation & Beautiful Design. • Browse your Friends, your most played games and much more! 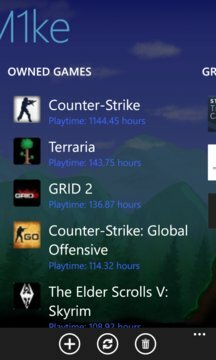 • View your total gaming hours, browse Steam news. • Pin Steam News right to your homescreen. • Pin Steam Status to know if Steam is down anytime! • This app does not have Steam Chat. • You will need to have your profile set to PUBLIC for this application to be utilised fully. • Add your profile to the application first, then you can pin it onto a Live Tile. You can also pin a Steam News tile from the home page.